These handy laminated 3.5" x 5.5" cards will help you shoot landscapes that are sharp from foreground to background! Can be used with any DSLR or mirrorless camera with an "APS-C" size sensor. Can be used with any DSLR or mirrorless camera with a "FULL FRAME" size sensor. Hyperfocal card for all cameras with 4/3rds sensors. Hyperfocal card for Canon 1D series cameras. "The hyperfocal card customized to my digital camera is just perfect." 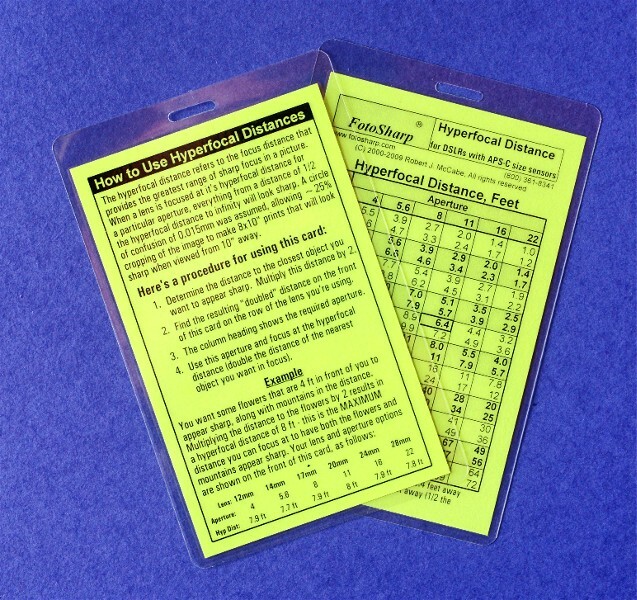 "The hyperfocal DOF cards have been a godsend. I especially like the example you site to help me understand." "This was great. Will fit in camera bag & I hate math!" "Your products are outstanding. Slip into my camera bag like a dream. One problem, they keep ending up in my friends camera bag." "Easy to use and understand guides - very practical." "Info on cards is organized well and easy to read." "Awesome. Will help me tremendously!" "Your guides are perfect for my classes." "There is a series of very nifty little guides that can clarify all of these issues, and more. Produced by FotoSharp, a series of 3x5 plastic-covered cards ... A few of those cards, and a nifty slide-rule type scale, directly address Depth of Field and also Hyperfocal distances." "I teach a photography course for 35mm, digital & film. I use FotoSharp hyperfocal cards & other kits with my students. They are easy to use and durable and are the best I have found."